When it comes to optical storage devices, the sky isnt the limit. Speed is. Read speed, write speed and re-write speed are the major selling points for these drives. Every optical storage drive manufacturers are constantly in a race to establish themselves as the market leader of optical storage drives, relentlessly pushing the envelope on how fast their drives can go in terms of read speed and write speed. In the past couple of years alone, weve seen CD-R write speed progressed from 8x to the current 52x, catching up with the long standing high CD-ROM read speed. This gain is a very huge leap in technological advancement as far as CD-R write speed is concern. Gone are the days when almost an hour is needed to write a 650MB CD to its brim, and not forgetting all the countless coasters from failed write attempts with the pioneer batches of consumer CD-Writers (notably those without today's Buffer-Underrun Protection mechanisms). The optical storage drives of today are fast and reliable compared to those of yesteryear. However, all good things have to come to an end, likewise for the old faithful CD. The existing CD storage solution is reaching its pinnacle for both read and write speeds. The present crème de la crème of consumer CD-Writers is in the form of the speedy 52x32x52x model, which most probably should be the last variant of its kind. 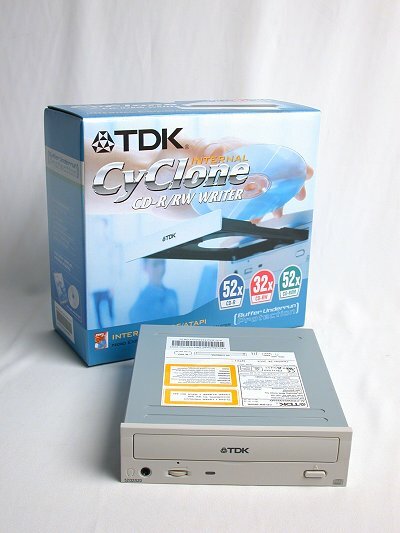 Amongst the handful of manufacturers releasing such a drive is TDK. They are responsible for breaking out of the norm by bringing us the CyClone line of CD writers with their blue translucent tray and with great performance to boot as well. Today, well be putting this drive through our usual fare of stringent tests to see how well TDKs latest addition to the Cyclone name holds up.